The film is the true story of Captain Richard Phillips (Hanks) and the 2009 hijacking by Somali pirates of the US-flagged MV Maersk Alabama, the first American cargo ship to be hijacked in two hundred years. “Captain Phillips” is directed by Oscar-nominee Paul Greengrass (“United 93,” “The Bourne Ultimatum”) from a screenplay by Billy Ray and based upon the book, "A Captain's Duty: Somali Pirates, Navy SEALs, and Dangerous Days at Sea," by Richard Phillips with Stephan Talty. A retelling of the headline grabbing events that occured on the high seas in April 2009 when cargo ship captain Richard Phillips, married father of two, surrendered himself to a group of four Somali pirates in order to protect his crew off the coast of Africa. After an unsuccessful escape attempt, he was subsequently rescued when US Navy SEAL snipers shot and killed three of the pirates. The film is produced by Scott Rudin, Dana Brunetti, and Michael De Luca. 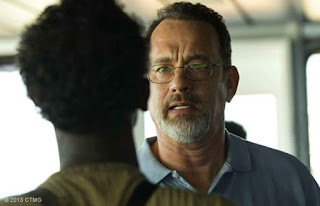 Opening across the Philippines in October 2013, “Captain Phillips” is distributed by Columbia Pictures, local office of Sony Pictures Releasing International.